Technology has helped Helen Purcell in both recording vital documents and ensuring elections are accessible and secure. Nearing the conclusion of her third decade of service in Maricopa County, Helen Purcell continues to embrace technology that makes both recording vital documents and ensuring accurate elections increasingly easy and secure. During an Oct. 14 presentation to the Greater Phoenix Chamber of Commerce Public Affairs Committee, Purcell detailed some of the ways her office has evolved to keep up with and use technology. The office’s abilities have grown substantially since the first document was recorded there in June 1871. Members of the public can now view that document – a picture of an open downtown square in Phoenix – and countless others, for free. “Our back-file conversion allows all of these images to be displayed at no charge,” Purcell said. 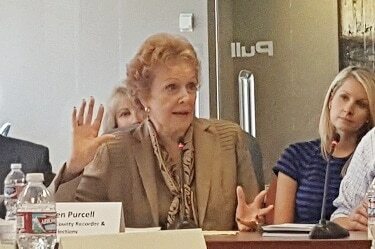 Purcell added that the public often forgets the recording work her office does, which accounts for a substantial amount of business. “We do hundreds of millions of dollars in commerce everyday in the recording side of our office,” she said. In addition to recording approximately 3,000 documents each day, Purcell’s office is also responsible for conducting elections in Maricopa County, where there are 2.1 million registered voters with nearly 60,000 registrations added during the past month. Purcell says her office is prepared to efficiently and effectively serve the residents of Maricopa County, not only on Election Day, but also the nearly 70 percent of voters that are on the Permanent Early Voter List (PEVL) and have already began receiving their ballots. “As of October 17, we have 25 early voting sites up and running around the Valley,” Purcell said. There will be 724 physical polling locations available for the Nov. 8 General Election. For those voting on Election Day, sample ballots go out 11 days before the election with each voter’s polling location and a map to get there. “If you walk in to a precinct that isn’t yours, we will look you up in an electronic poll book, see where you precinct should be, and provide you the address of that precinct and the major cross streets,” Purcell said. And just in case there are any questions regarding the safety of cast and counted ballots, Purcell allows anyone with a computer and internet access to watch what is going on in tabulation rooms at any time.